How to Strategically Target Your Content and Lead Generation Campaigns to Disrupt the Status Quo and Facilitate the Sale. Part 1. Content That Converts: Learn how to use disruptive content to sell change. If customers aren't ready for change, they will not buy. Part 2. Lead Gen and Nurturing Strategies: Learn how to market beyond the C-Suite, which is critical because non-C-Suite employees have twice the influence on buying decisions as their C-Suite bosses. The essays show that nurturing key people in the buying group—the Mobilizers—requires new content tools, different messaging strategies, and new lead nurturing methods. 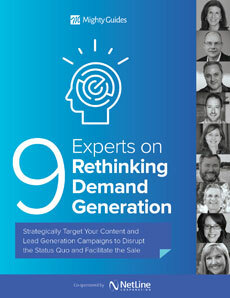 They offer practical advice and actions you can take to improve your demand gen game. If you're interested in capturing high-value leads—not to mention improving relations between sales and marketing—you will appreciate what you find here. By downloading this eBook you may be contacted by the contributors and sponsors of the resource. By downloading this eBook I agree to be contacted by NetLine Corporation and Mighty Guides.